As an undergraduate at Stan State, Tara Dybas was diagnosed with cancer. Fighting her way back to health, she found motivation and determination in focusing on her educational goals and creating the life she wants to live. “I was extremely sick,” said Dybas, who remained at Stan State to pursue her master’s in English literature. 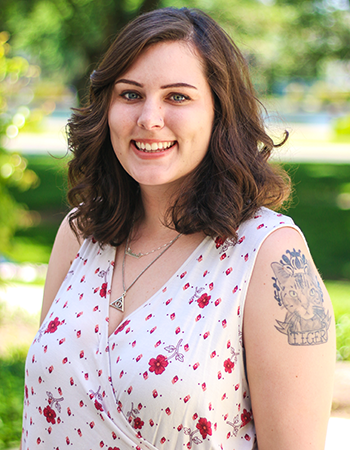 “I used to joke that Stanislaus State would have to give me a posthumous degree.” Returning to school for her final undergraduate year was both a triumph and a tremendous challenge, juggling classes and therapies to continue her progress. As a graduate student, she dove into English Department activities and worked at the Writing Center, all in the pursuit of what she hopes will be a Ph.D. In that effort, Dybas will enroll at UC Riverside this fall. “Having had my life upended by a devastating cancer diagnosis, I’ve been motivated to do exactly what I want in life, and what I’ve always wanted is to be a Shakespeare scholar,” she said. Her grit and commitment gained the notice of faculty members. “Much is remarkable about Tara,” said Jesse Wolfe, professor of English. “I can testify that she's a terrific writer, an articulate interlocutor and a warm colleague to her fellow students. But her commitment to campus life extends beyond the classroom. She has competed in two Student Engagement in Research, Scholarship, and Creative Activity (SERSCA) research competitions, been a teacher’s assistant for three courses, taught a first-year composition course and tutored graduate students in writing, all while maintaining various jobs on and off campus.” Dybas also presented at four conferences, an achievement Wolfe termed “a rare attainment” for a master’s student. “My ultimate goal is to teach Shakespeare and other early modern dramatists, and my hope is that I’ll be able to teach at a CSU. I’ve been incredibly fortunate to benefit so much from the CSU. I want to return the favor of quality education,” Dybas said. “I’ve been fortunate to develop close bonds with so many professors in the English Department, but without a doubt, Dr. Tony Perrello is my dude. Five years ago, I took a Shakespeare course with him and that was it — now I’m on my way to a Ph.D. program so I can teach early modern literature at the university level. Dr. Perrello has been enormously supportive. He’s given me so many opportunities for professional development — thesis writing, teaching assistant positions — and he’s become my friend in the process."